Two journalists have been killed near Donetsk airport in eastern Ukraine, as a shell hit the car they were travelling in, officials from the self-proclaimed Donetsk People's Republic (DPR) have said. "A car carrying two local journalists was destroyed by an anti-tank missile. It is not possible to recover the bodies at the moment due to heavy fire coming from the Ukrainian side. Currently we're trying to determine what news outlet the slain journalists were working for," a DNR militia source told the Sputnik news agency. Another source, also a DPR representative, told the Donetsk News Agency that the two journalists died near the town of Peski, in the Donetsk region late on Sunday. The source also said the journalists were killed by a shell that hit their car and presumed the attack was carried out by the Ukrainian military. A report from Interfax, citing a source from the Joint Center of Control and Coordination, which is monitoring the ceasefire, suggests only one journalist was killed, while his colleague managed to jump out of the car. An investigation has been launched into the incident, according to the DPR Defense Ministry. "For now, the circumstances of the incident are being clarified. A more detailed and comprehensive account will be given tomorrow," said a DPR Defense Ministry spokesman Eduard Basurin. The Deputy Chief of Kiev's so called "Anti-Terror Operation" told 112.ua that the Ukrainian army “didn’t fire a single shot” on Sunday. Reports of violence come amid a ceasefire brokered by the leaders of France, Germany, Russia and Ukraine, dubbed the Minsk-2 agreement, in the Belarusian capital on February 12. It was agreed the sides in the conflict would pull heavy weapons back from the frontline and establish a security zone separating them. International monitors have said the truce is generally holding, but there have been sporadic incidents of violence. The Organization for Security and Co-operation in Europe has been monitoring the implementation of the ceasefire in eastern Ukraine. On Sunday, its special mission (SMM) reported “renewed fighting” near Shirokyno. Shirokyno is close to the front line, and under the Minsk-2 agreements, weapons have to be pulled back from this area. 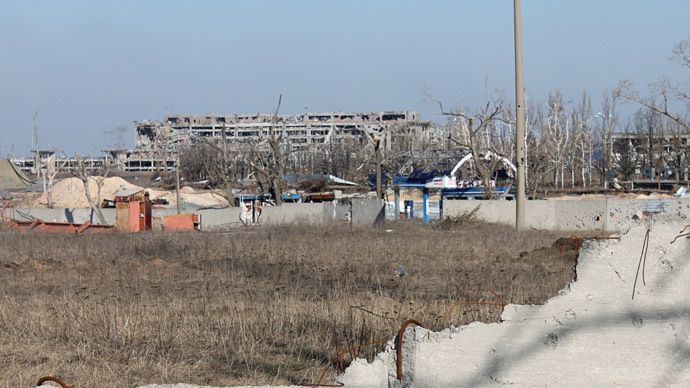 “Following an SMM-facilitated, three-day period of relative calm, at 18.35hrs on 11 April, the SMM – positioned on the eastern outskirts of government-controlled Berdyansk (2km west of “Donetsk People’s Republic” (“DPR”)-controlled Shirokyno) – heard a tank round being fired. It assessed it to have been fired from government-controlled territory approximately 500 meters from its position, and to have impacted in or around Shirokyno,” the report said. It added that the mission’s monitors in Mariupol heard “intermittent to heavy mortar fire” in the area, and “saw flashes indicative of such fire from that area”. According to the report the engagement lasted approximately three hours. The UN estimates over 5,600 people have died in the conflict. However, the true figure could be much higher. Five journalists have been killed during the unrest. Four of them were Russian citizens and one was an Italian national. Human rights organizations have repeatedly called for an end to repressive measures taken against the press in Eastern Ukraine.